The collective noun for ravens (as in a gaggle of geese) is an “unkindness” and when I see a group of them fly over I always get the impression I am watching a street gang. They are fairly heavy birds and you can hear their wings – swish, swish, swish – beat the air as they pass by. Ravens, found across the northern hemisphere, typically live about 10 to 15 years in the wild, although lifespans of up to 40 years have been recorded. Young birds may travel in flocks, but later mate for life, with each mated pair defending a territory. The Common Raven has coexisted with humans for thousands of years and in some areas has been so numerous that it is considered a pest. Part of its success comes from its omnivorous diet; Common Ravens are extremely versatile and opportunistic in finding sources of nutrition feeding on carrion, insects, cereal grains, berries, fruit, small animals, and food waste. Ravens are classified as songbirds. Though I have never thought of them as particularly musical they do make a very large number of sounds. Ravens mimic sounds from their environment, including human speech. Ravens are highly intelligent. Their brains are among the largest of any bird species. They display problem solving abilities, as well as other cognitive processes such as imitation and insight. One experiment involved a piece of meat attached to a string hanging from a perch. To reach the food, the bird needed to stand on the perch, pull the string up a little at a time, and step on the loops to gradually shorten the string. Four of five Ravens eventually succeeded, and “the transition from no success (ignoring the food or merely yanking at the string) to constant reliable access (pulling up the meat) occurred with no demonstrable trial-and-error learning” This supports the hypothesis Ravens are ‘inventors’; that is, they have the ability to solve problems presented to them. Many of the Raven’s problem-solving skills were formerly thought to be instinctive, but it is becoming clear that Common Ravens are actually quite intelligent. Ravens have been observed to manipulate others into doing work for them, such as by calling wolves and coyotes to the site of dead animals. The canines open the carcass, making it more accessible to the birds. They watch where other birds bury their food and remember the locations of each other’s food caches, so they can steal from them. This type of theft occurs so regularly that Ravens will fly extra distances from a food source to find better hiding places for food. They have also been observed pretending to make a cache without actually depositing the food, presumably to confuse onlookers. Ravens living in urban environments have been known to drop nuts that they are incapable of cracking open with their beaks into busy road intersections. They allow the traffic to drive over them, crushing the nuts. When the traffic stops, they swoop down and pick up the nuts to eat. Biologists have recognized that birds engage in play. Juvenile Ravens are among the most playful of bird species. They have been observed to slide down snowbanks, apparently purely for fun. They even engage in games with other species, such as playing catch-me-if-you-can with wolves and dogs. Ravens are known for spectacular acrobatic displays, such as flying in loops or interlocking talons with each other in flight. Ravens are one of only a few species who make their own toys. They have been observed breaking off twigs to play with socially. In many post-conversion Western traditions, ravens have long been considered to be birds of ill omen, in part because of the negative symbolism of their all-black plumage and eating of carrion. In Sweden, ravens are known as the ghosts of murdered people, and in Germany as the souls of the damned. In Danish folklore, a Valravn that ate a king’s heart gained human knowledge, could perform great malicious acts, could lead people astray, had superhuman powers, and were “terrible animals”. As in traditional mythology and folklore, the Common Raven features frequently in more modern writings such as the works of William Shakespeare, and, perhaps most famously, in the poem “The Raven” by Edgar Allan Poe. Ravens have appeared in the works of Charles Dickens,J. R. R. Tolkien, Stephen King, and Joan Aiken among others. The raven is also the mascot of the professional football team based in Baltimore, Maryland. It continues to be used as a symbol in areas where it once had mythological status: as the National Bird of Bhutan, Official Bird of the Yukon territory, and on the Coat of Arms of the Isle of Man (once a Viking colony). Many indigenous peoples of the Pacific Northwest Coast of North America and northeast Asia revered it as a god. In Tlingit and Haida cultures, Raven was both a Trickster and Creator god. Related beliefs are widespread among the peoples of Siberia and northeast Asia. The Kamchatka peninsula, for example, was supposed to have been created by the raven god Kutkh. There are several references to Common Ravens in the Old Testament of the Bible and it is an aspect of Mahakala in Bhutanese mythology. The Norsemen believed that ravens Hugin and Munin sat on the god Odin’s shoulders and saw and heard all, and a Raven banner standard was carried by such Viking figures as the Norse Jarls of Orkney,King Canute the Great of England, Norway and Denmark, and Harald Hardrada. In the British Isles, ravens also were symbolic to the Celts. In Irish mythology, the goddess Morrígan alighted on the hero Cú Chulainn’s shoulder in the form of a raven after his death. In Welsh mythology they were associated with the Welsh god Bran the Blessed, whose name translates to “raven.” According to the Mabinogion, Bran’s head was buried in the White Hill of London as a talisman against invasion. A legend developed that England would not fall to a foreign invader so long as there were ravens at the Tower of London; although this is often thought to be an ancient belief, the official Tower of London historian, Geoff Parnell, believes that this is actually a romantic Victorian invention. 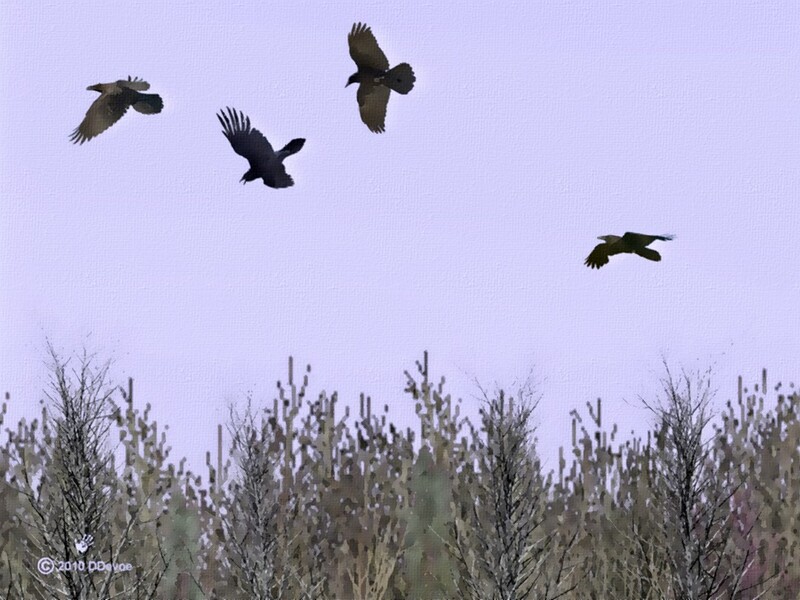 In fact, the Tower has lacked ravens for long periods in the past; they were last reintroduced after World War II. The government now maintains several birds on the grounds of the Tower. These are among the most interesting of our wildlife species. I recommend you try one of the fine books about them in your library.